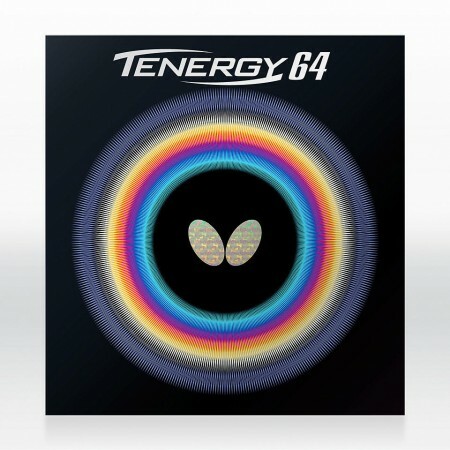 TENERGY 64 is the fastest attacking rubber of the TENERGY family; the No. 64 being the development code of the pimples used in producing this reversed rubber. BUTTERFLY High Tension technology has enabled a fast dynamic rubber to be produced by utilizing the innovative SPRING SPONGE. SPRING SPONGE enables a player to "grip" the ball and "catapult" the return back at high speed and with heavy spin. It is one of my favorite rubber. Saab, have reached quite a high standard, if not to the extent of 05 also the amount of rotation of the drive. 05 performance from fully pulled out of does not pull out not to be a decent consumer, but 64 does not select the user if it can be the foundation even weak to some extent impact. Both of rotation and the speed of this rubber unique is please try by all means once. The speed was very good, but I was not worried about the spin I was worried about. I thought that techniques such as serving and rotating were not good enough. But long serve and fast serve were very good. That's why I can't say that it isn't messing up. I thought that inquiries and rally etc. are usually good. I think it is highly recommended people who want to attack with speed. But I do not recommend it much because there are lots of better rubber etc. Tenaji Deji's forehead, lovers are backfaces. 80 or 05 is recommended for middle-level and advanced people with some power. Balance is good by matching it with a racket that emphasizes rotation. I felt like I was getting out on par with Rosena because of the speed. I tried to use it for three months. The swing was easy because I hit a fast drive and it is light. I thought it would be difficult to make a beating method that would be stronger than the other. Although my technical skills are lacking, the ball has fallen. Since I was ALC.S, I think that those who want to use it with a hard racket are good. It's easy to handle anyway. I fly by the first in tenazi. It is impossible for beginners to begin with, but it is the best rubber for intermediate-grade people who have a feeling of spinning. If you have a feeling of spinning, you can spin as much as you want, and speed will come out naturally, so there are no drawbacks. Although it is a little expensive, I thought that I wanted speed and used it. As a result of using it, the shot feeling was so soft that I could hardly think that I used the same sponge as Tenazi 05, and it was easy to control. I felt a little close to tenaji 05 fx as a feeling of being struck. In addition, the speed was satisfactory, the ball which was firmly rotated even from the backwards entered deep into the opponent's table, and hit a ball that was difficult to target the counter. However, it is recommended that you use 64fx for first-intermediate users, as there will be no rotation or speed unless you make a firm impact on how to let it dig into.